After reading about Lori's sourdough English muffins at Finding Radiance, I decided to try my hand at sourdough starter. 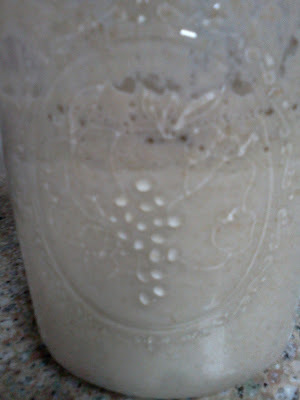 (Check out this interesting article on the health benefits of sourdough.) I mixed equal parts 100% white whole wheat flour and water in a bowl. I fed starter with equal parts of flour and water on a daily basis, discarding some of the starter each time so it wouldn't take over the house. After five days there was activity! 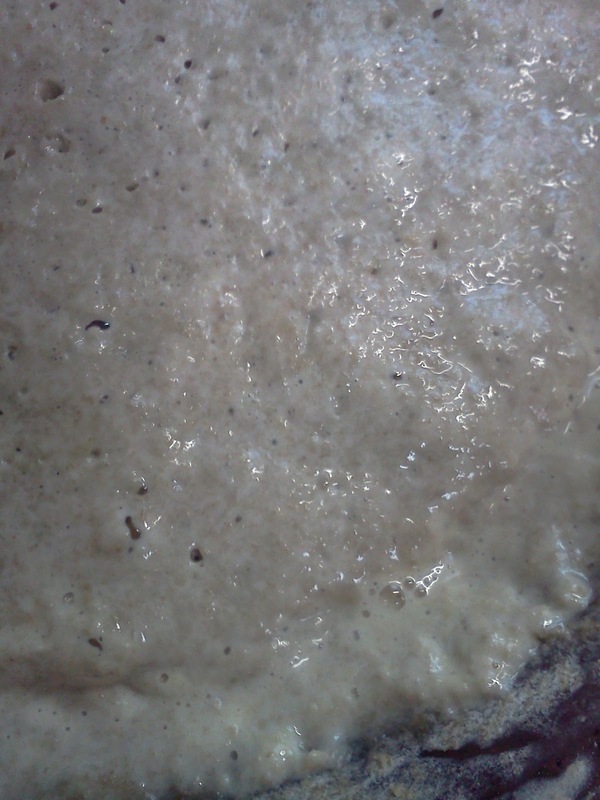 The kitchen started smelling like a bakery, all yeasty and delicious. 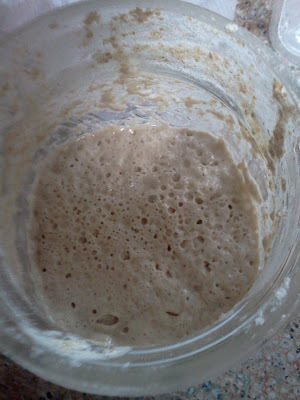 I transferred it to a clean mason jar and kept up with daily feedings and the activity got stronger. 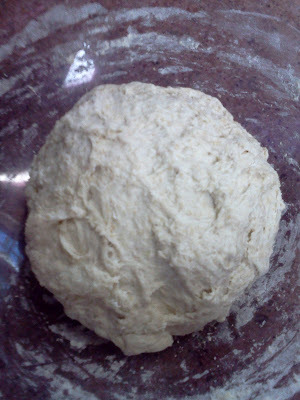 Yesterday I started the dough for the bread. I mixed up 1.5 cups of warm water with 1.5 teaspoons of kosher salt and 0.5 cups of The Fountainbread. I mixed in a pound of 100% white whole wheat flour until a dough formed. I covered the bowl and stashed it in the oven (in off position) for 19 hours to proof. 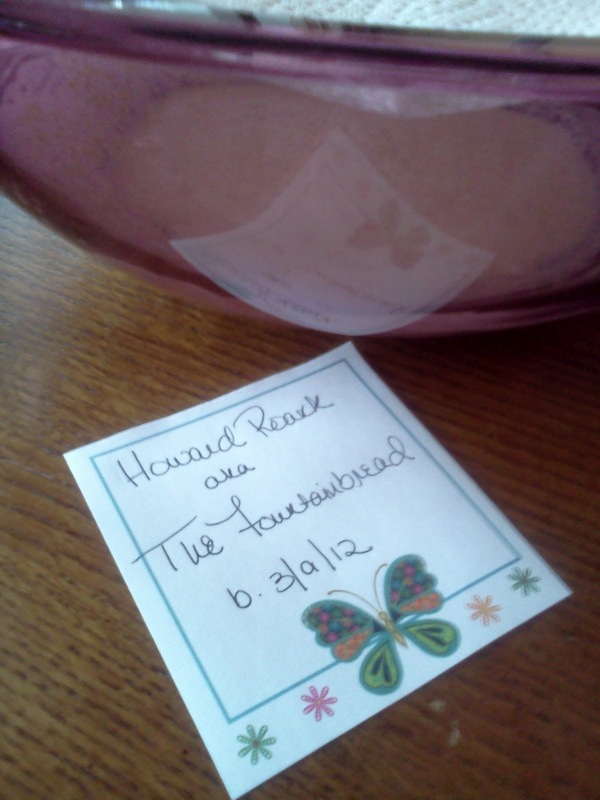 I check the bowl today at noon and success! 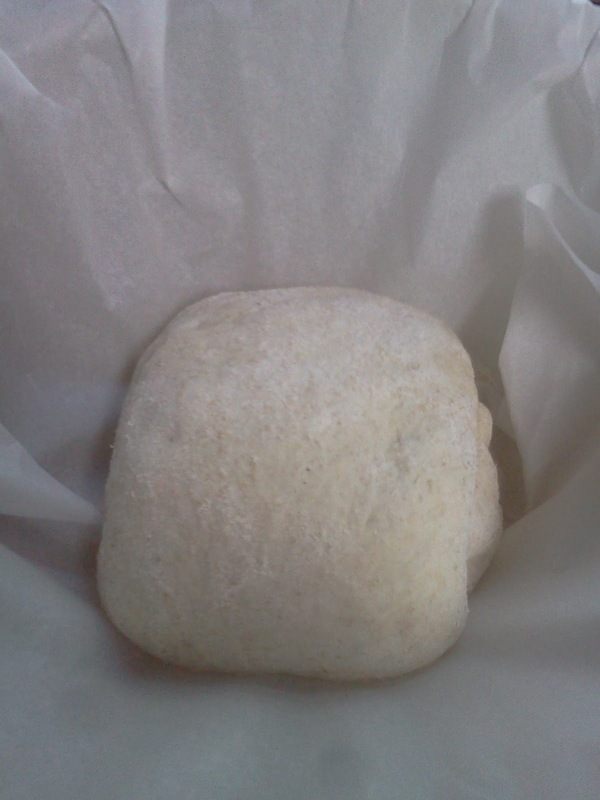 I scraped the dough onto a floured surface, patted it out and folded it in thirds and thirds again, I placed the dough back in the cool oven to rise again. Take note of the parchment sling, this is for easy transfer. Three hours later ready to bake. 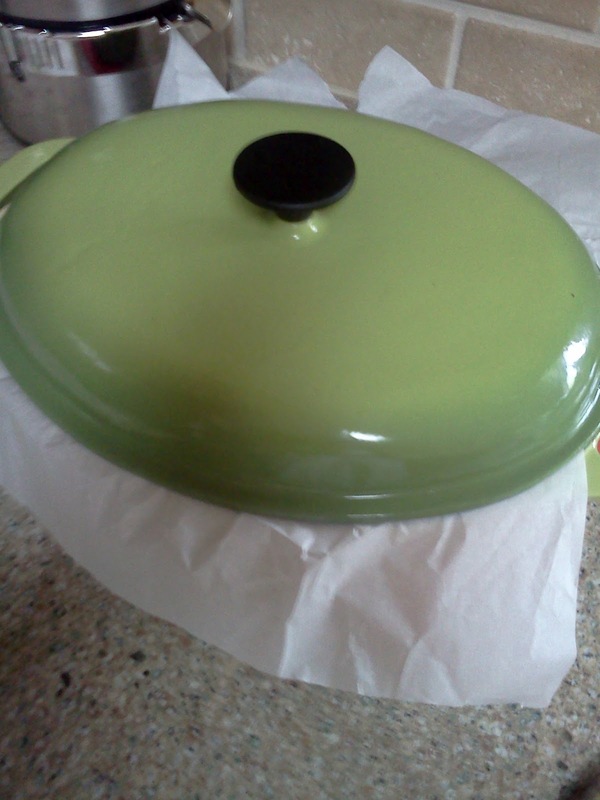 I preheated my enamel cast iron pan, cover and all, in the oven to 450 degrees then carefully removed the lid and put the dough into the pan. It baked for 30 minutes with the lid on and 15 minutes with the lid off. 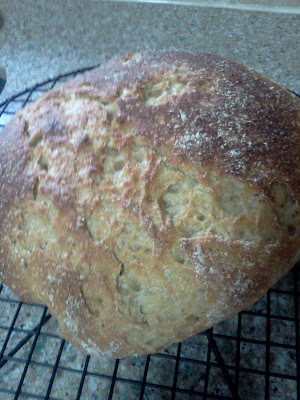 The loaf came out crusty and golden. I didn't get that much rise, I'm thinking it might be because I used whole grain flour for both the starter and the loaf. 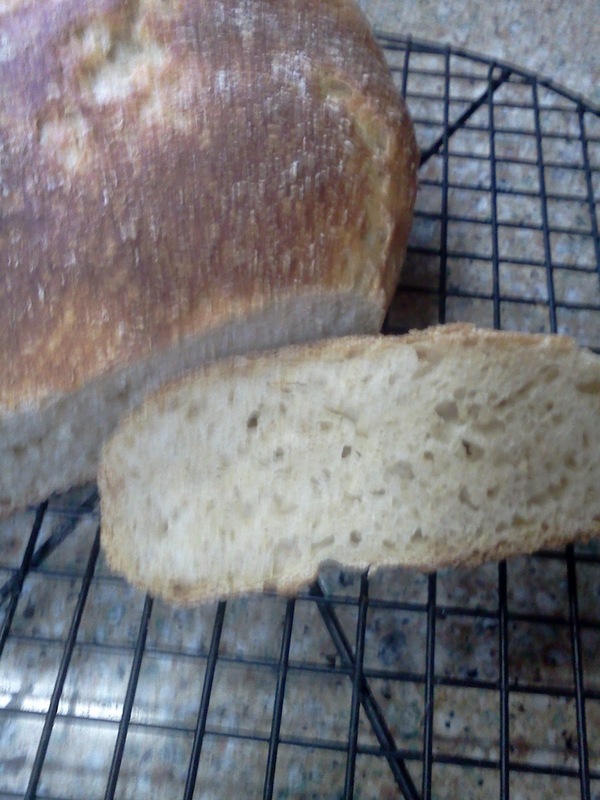 But the lack of rise on the baked loaf in no way compromised the wonderful sourdough flavor and chewy texture. I was more than pleased with the first try. 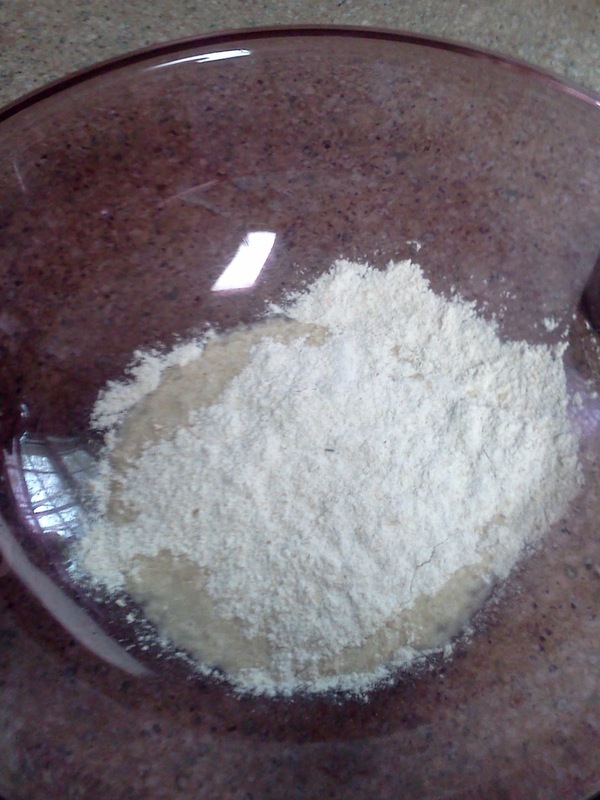 Next time I will try all purpose flour with the whole wheat starter and compare the results. 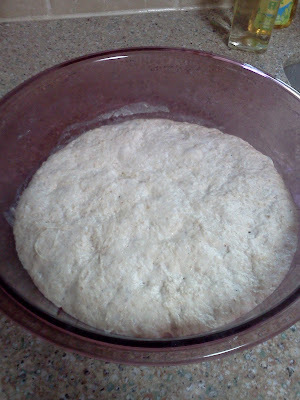 Until then I'm going keep nurturing The Fountainbread so he'll get stronger and more active and more flavorful. It's amazing how some things can sound so complicated yet turn out to be so simple. 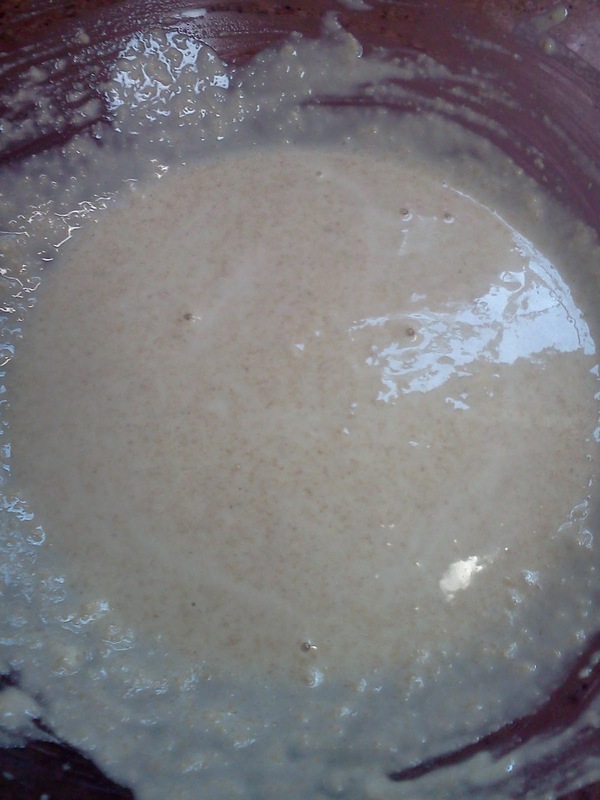 Go ahead and mix up a batch of starter and see what happens. You might surprise yourself, I sure did! That bread looks absolutely delicious!! 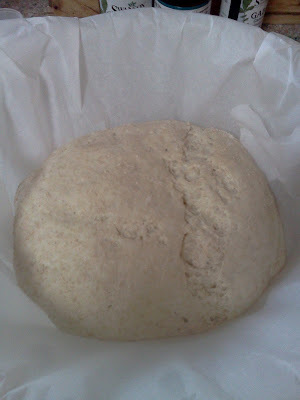 That looks fantastic, I love making my own bread, so much tastier, that is pure dedication though!!! Hey Andra! Another one of those documentaries just came out this week - it's www.hungryforchange.tv and you can watch it online for free until March 31. It's POWERFUL. our family is on the road to excellent health, and this just confirms the direction we're going. I hope you find it as hopeful and life-bringing as I did! !